Viega Climate Panel and Uponor Quik Trak are essentially the same product made of 1/2” plywood with the aluminum on the underside using very small 5/16” PEX pipe. Ecowarm Radiant Board is much more efficient than Climate Panel or Quik Trak resulting on lower operating costs. In contrast, Ecowarm RadiantBoard has the aluminum on the top of the board and uses much larger 1/2” PEX pipe resulting in significantly higher output and lower operating cost for Ecowarm RadiantBoard over Climate Panel or Quick Track at the same supply water temperature. See the published data below. The small PEX tubing size utilized by Climate Panel and Quik Trak significantly reduce loop lengths possible, resulting in many more connections and complications in routing pipe and added cost. Any quality ASTM F876-877 1/2” PEX may be used with Ecowarm RadiantBoard whereas the tubing and fittings for Climate Panel and Quick Track can be bought only from Viega and Uponor Distributors. Compare published output charts below published by Ecowarm RadiantBoard and Uponor Climate Panel of a 20 BTU/SQFT/HR output with a R-.5 floor covering. Climate Board requires 114°F average water temperature vs 98°F for Ecowarm RadiantBoard under these conditions.. 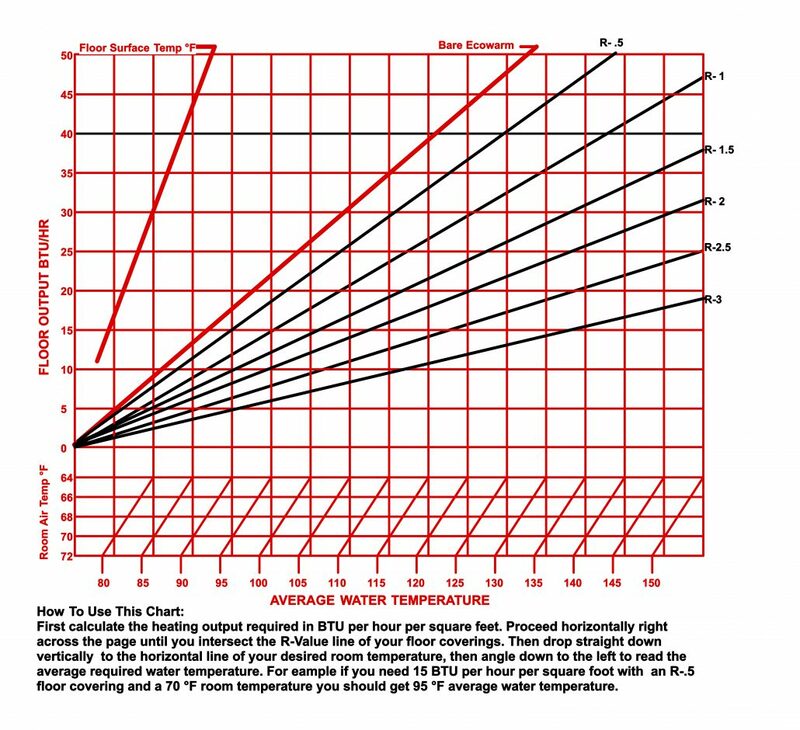 The lower the supply water temperature the more efficient the system.